In this blog I will show you to accomplish this in a few easy steps. 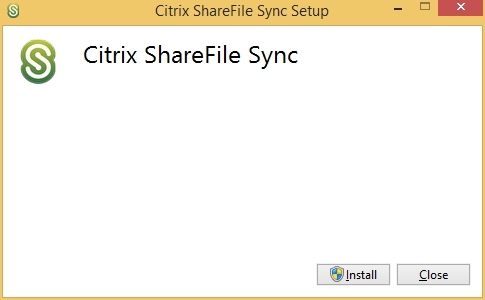 Other than on a local desktop or laptop, you will need to install the ShareFile Sync for Windows On-Demand version (Certified for XenApp and XenDesktop). The main difference between this version and the local desktop/laptop version is that files are not automatically be available offline. The file will be downloaded on the moment the user opens the file. 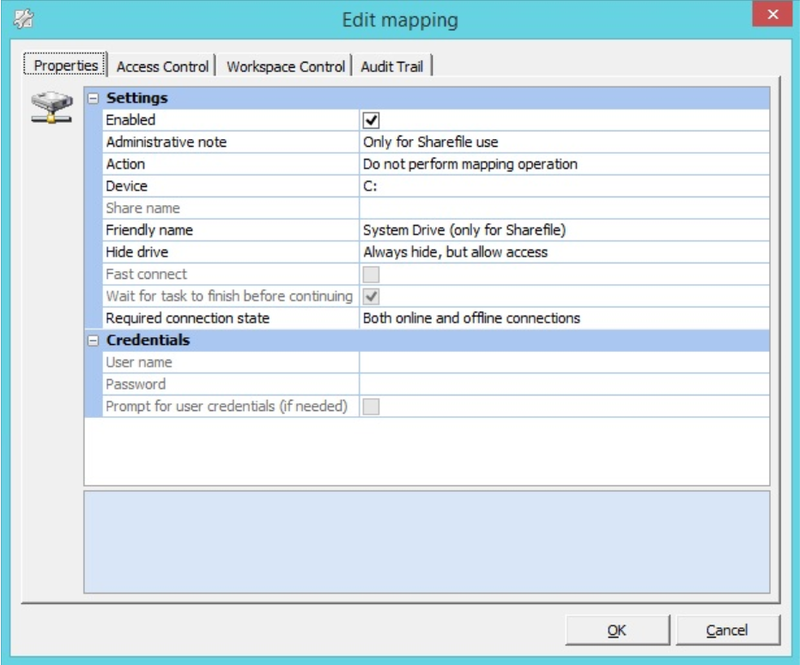 Install the ShareFileOn-demand.admx in the Policy Definitions directory of the Active Directory so that it is possible to set these settings global. 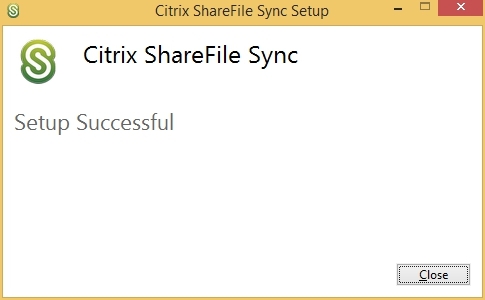 For almost every ShareFile implementation I configure SAML integration for authentication (XenMobile AppController or ADFS). 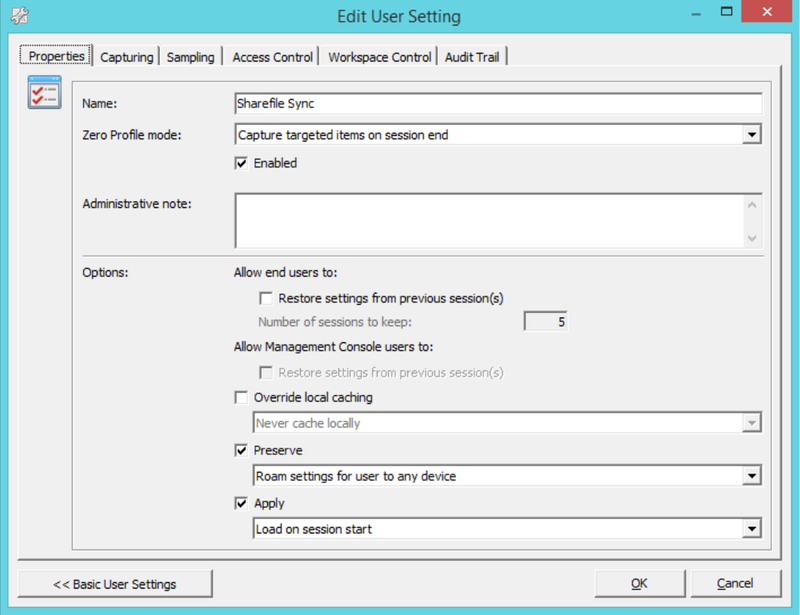 Therefor I set the following policy settings so that the Windows Sync client will automatically configured without interaction of the end user. 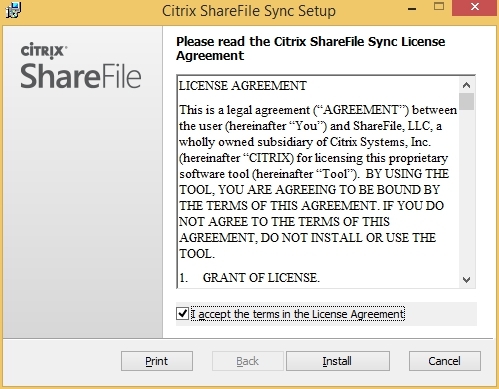 If not every Citrix XenApp or XenDesktop user gets a ShareFile account we need to limit access to the Windows Sync client. This can be easily done with the RES Workspace Manager, but as an alternative you can configure this also with GPO’s. To make the ShareFile Sync client work for a selected ShareFile user group, the registry keys removed from the HKEY_LOCAL_MACHINE must be added to the HKEY_CURRENT_USER by using User Registry in RES Workspace Manager. 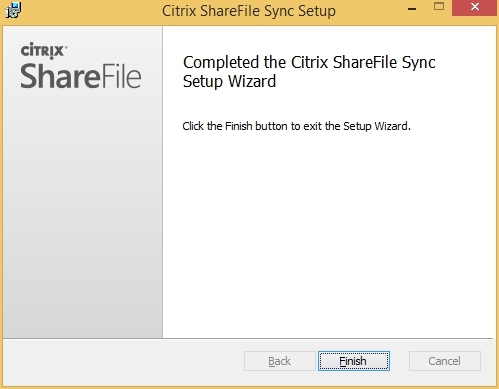 For the ShareFile Outlook Plug-In 3.3 use the Per-machine MSI version. This is a silent installation without any installation dialogs. Also the automatic update function is not available in this version. This is also not recommended in a XenApp / XenDesktop environment where also a read only vDisk is used. 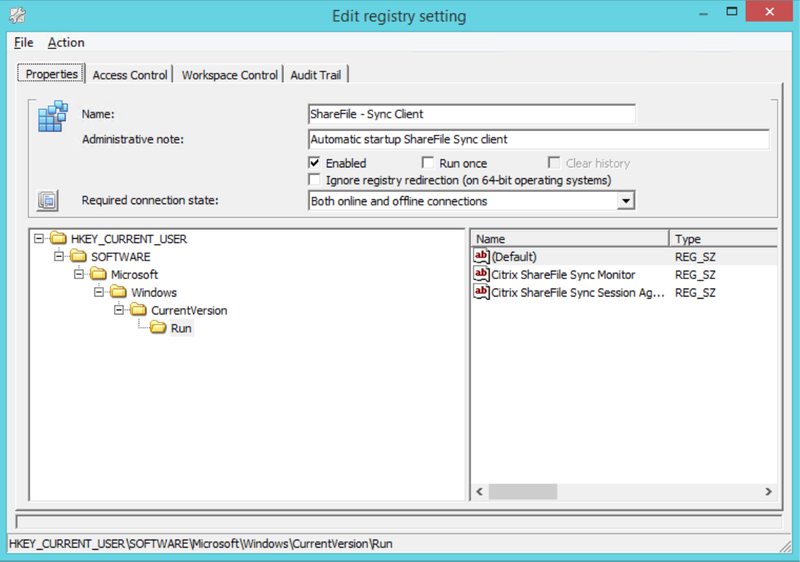 Within RES Workspace Manager make a new User Registry with the above registry key but then for the HKEY_CURRENT_USER and add an Access Control filter for the ShareFile Active Directory user group. 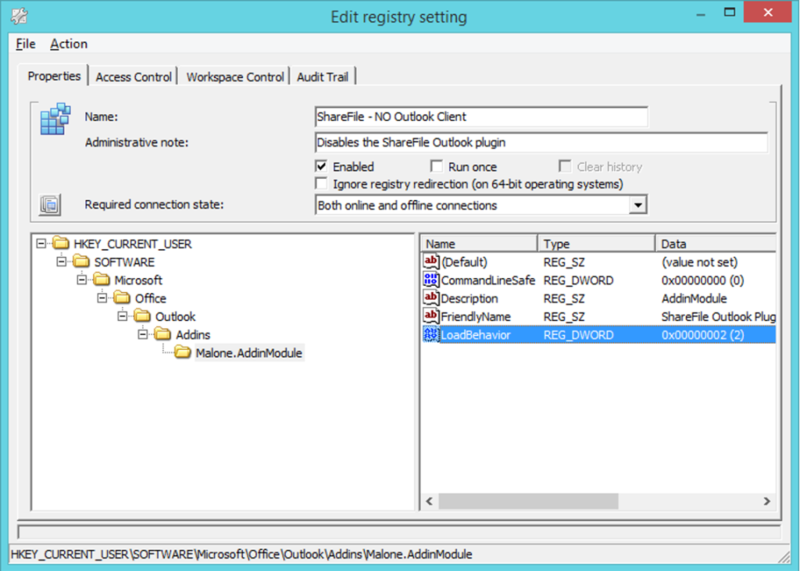 Keep in mind the Load Behavior registry key. If it is set to 3 the plugin will be loaded, if it is set to 2, the plugin will be disabled. 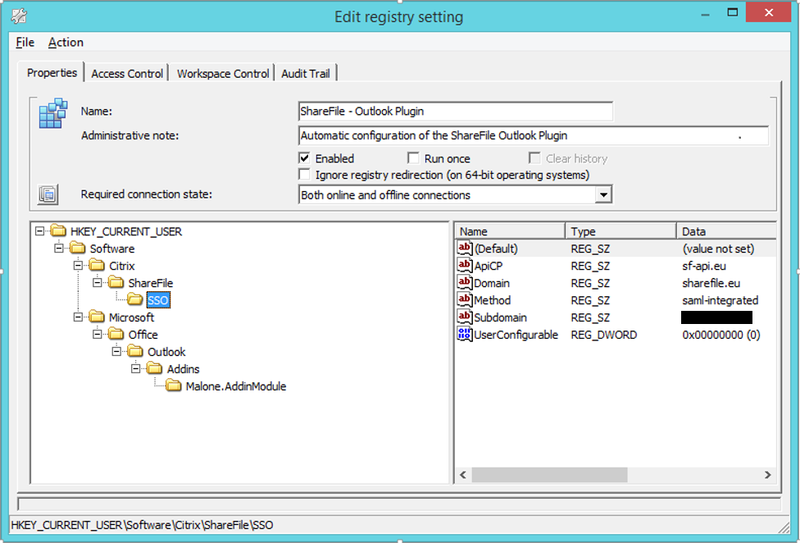 To auto configure the ShareFile Outlook Plugin for the end user with the correct authentication method, a registry key can be applied for the ShareFile users. With this registry key applied, the end user will no longer gets the “Getting Started” wizard and the Plugin is silent configured. Thanks for this interesting post – Suddenly only a few People and Companies today works with RES products. Great doc. 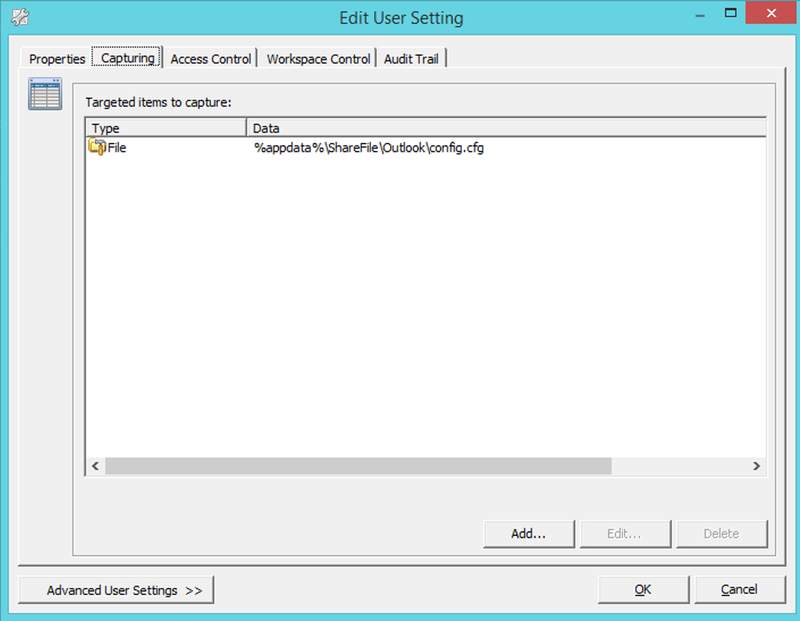 I’ve been setting up the Outlook Plugin with SSO and when I logon as a user who has access I can see the keys are applied and when I go into the plugin settings I can see the values coming through BUT the ShareFile Username (which is the email address) is not populated. Is there a way to pass this through as well? Hi C, Good to hear that you fixed it.